LONDON, UK (ANS – August 6, 2017) – John David Beckett Taylor, the son of Jamaican immigrants, who was raised in Birmingham, England (where I also grew up), was shocked when the then British Prime Minister John Major offered him a life peerage in the honourable House of Lords. “At first, I thought he was joking,” Lord John Taylor of Warwick said in a story written by Mark Ellis, a senior correspondent for the ASSIST News Service. “It was a complete shock.” At the age 43, he told Major he could imagine such a thing happening in about ten years. But the prime minister persisted, and Taylor accepted the offer. It seems the rising attorney, politician, and television talk show host caught the attention of Britain’s most powerful elite. Born out of wedlock to a professional cricket player and a nurse, Taylor’s early years were rough. “My upbringing was not easy,” he recalls. “It was tough growing up in the inner city.” But his praying mother took him to Sunday School every week and gave him a piece of advice that clung to him through the years: “Being black is not a profession,” she said, and insisted he build his future through hard work, personal achievement, and values. His book “No Blacks, No Irish, No Dogs’’ recaps his humble origins. Now Lord Taylor, a committed Christian, has again made history with his real-life romance between two people and two nations. It is the true story of the first American in 110 years to marry a serving Baron of Britain’s House of Lords. This history was made in May 2015, when Lady and Lord Taylor wed, off the shores of Rome. Laura and John had been on very different journeys before their present life together in London. Baron Taylor of Warwick took his bride from the big sky American Heartland farmstead on a dirt road in rural Wisconsin, where she taught Art at a local school. Laura, also a committed Christian, attended Christ For The Nations College in Dallas, Texas. In her young adult years, she ministered with Teen Challenge who sent her to remote poverty-ridden world locations. So, it was quite a revelation for Laura last year to attend the Queen’s State Opening of Parliament, sitting on the Peeresses’ Bench, in the Victorian House of Lords. Broadcast live on television before millions, Lady Taylor of Warwick was escorted to her seat down the centre isle of the Palace Chamber, just a few feet away from Her Majesty, Queen Elizabeth II. This year, at the Queen’s State Opening, Lady Taylor was given the special privilege of sitting alongside the Lords on the Barons’ Benches. This unique couple was also given another unusual favour, being seated together side by side in the historic hall. The more I have learned about this unique couple, the more I have discovered a remarkable destiny unfolding. When the Queen appointed him as a Lord in 1996, John Taylor became the only Black Baron in the world… amongst Dukes, Duchesses, Earls, Viscounts, Bishops and Law Lords. 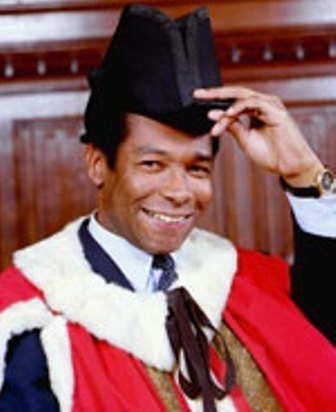 He was one of the youngest members to ever sit in the House of Lords, and also became the first black Conservative Lord since the 14th Century, when Parliament began. Fast forward and we find providence leading Lord Taylor of Warwick to cross the path of a Texan rancher American beauty who had only seen London on television. It is deeply symbolic that Laura and John met in Atlanta, Georgia. It was in that city in 1962 that Ray Charles was fined for refusing to sing to a segregated black/white audience. Eight years after they met in Atlanta, it was Laura’s children who brought the two together. Two people and two nations. They describe their marriage as a supernatural union, with every day a blessing and reward. “I have done my best to explain the virtues of English cricket to Laura, whilst she has told me the only ‘cricket season’ during her Texan childhood were the insects that came out at night!” he laughed. John’s love of cricket led him to play for The Warwickshire Bears County Youth team. He is also an avid soccer fan of Aston Villa Football Club. Indeed, he was very proud to play for the Aston Villa Celebrity All Stars, raising money for the Acorns Children’s hospice. (We have had some interesting e-mail discussions about his support for Aston Villa, as I support their deadly rivals, Birmingham City FC, so we have agreed to disagree on that topic). John is the only Parliamentarian in history to have played for both the England and Scotland Parliamentary International Soccer teams. He has also even sparred for Charity with the former Middleweight Boxing Champion of The World! The House of Lords (or House of Peers), is the upper house of Parliament and originates from the original Knights of the Round Table in Medieval England. The Palace of Westminster was the primary residence of the Kings of England. Today, it is where the House of Lords Chamber is and where Lord Taylor of Warwick has given speeches for over 21 years. One of Lord Taylor’s personal legislative Bills was to introduce and carry through the Criminal Evidence Amendment Act 1997, which established Britain’s first ever DNA Database. It changed forensic science forever. In addition to spearheading important Acts of Parliament, John has been a champion of peace-making, along with diversity and the development of youth. For over 20 years he has mentored young leaders from nations around the globe, establishing an International Leadership Academy, The Warwick Leadership Academy (formerly WLF) in 1997. Laura now serves as a WLA Director and the WLA —www.lordtaylor.org/warwick-leadership-academy/ — which has brought together different nationalities and cultures of the world in harmony rather than division, investing in the futures of young leaders from over 50 nationalities, including Israeli and Arab. To find out more of what makes this Baron tick you can also peruse over 452 Parliamentary Questions presented by Lord Taylor at http://myparliament.info/Member/1796/WrittenQuestions. There is much more to Lord and Lady Taylor of Warwick than one would expect from an English Lord and Lady. A sample of the sheer diversity of their daily life can be seen at Twitter — https://twitter.com/lordjohntaylor — and Facebook — https://www.facebook.com/lordjohntaylor. Lord Taylor’s policymaker and influencer role in politics has not come without controversy. He has had brutal attacks on his career and family, as does any statesmen who make a mark in history, especially as a black pioneer peacemaker. The fact that John is also the son of a Jamaican immigrant adds even more unconventional flair to his personal story. He has not been afraid to speak out against racism, as you’ll read here — http://news.bbc.co.uk/2/hi/uk_news/politics/1304393.stm . In 1992 John was the first Black Conservative Parliamentary candidate in British history. Many viewed the contest in Cheltenham as highly influenced by the issue of race. He quickly became the one to watch. His role in public life has been recognised, such as being the first Black Baron to have his portrait in the National Portrait Gallery and inclusion in the 100 Great Black Britons Hall of Fame. Lord Taylor’s career has been marked by a number of “Firsts”. He was the first black Government Special Advisor in Britain, advising the Home Secretary and Ministers of State. The list is too lengthy to mention all Lord Taylor’s firsts here, but ponder this” he was the First black Vice President of the British Board of Film Classification (BBFC), the first black Board member of a Regional Health Authority and the first black British University Chancellor. These achievements in themselves offer strong argument for diversity, when sadly even today only 1% of top Board positions in Britain are held by Black and Ethnic minorities. During his tenure at the BBFC, no movie got a film rating in Britain without going through Lord Taylor. He also presented a myriad of screen and actors’ awards in Hollywood. More recently John has been an actor himself, when he played the lead role in William Shakespeare’s play Hamlet. The venue was the legendary London’s Rose Playhouse Theatre, where the Bard originally staged his plays in the 16th century. Lord Taylor’s “Firsts” go beyond UK borders, as John brought an international flavour to the USA, as the first British Lord to be appointed as a Kentucky Colonel, at the same time as being granted the Freedom of Lexington. The couple are also looking forward to John’s upcoming book launch in Las Vegas. It was there in 2007 that Las Vegas honored him with The Key to Las Vegas and proclaimed a “Lord Taylor of Warwick Day”. John was also honoured to be the first black Baron to open a hospital in his ancestral homeland of Jamaica, when he presented a cheque for $500,000 to the only major Orthopaedic unit in the Caribbean. John’s firsts began in early life when he was appointed Head Pupil at Moseley Grammar School and was the first member of his family to attend University. One would assume that he had a background in law, but John was the first black Law student to win the prestigious Gray’s Inn Advocacy Prize. After he was Called to The Bar, he became the first black member of his Barrister’s Chambers, based in Birmingham and Middle Temple, London. He went on to be appointed by the Lord Chancellor as a Judge. Being a Judge, one would never have guessed that this English Lord, who serves in the highest levels of government, would also be an experienced television and radio host, presenting many shows, mainly for the BBC. When he hosted The John Taylor Show on BBC Radio 2, Britain and Europe’s most popular radio station, he was the only black host. As a broadcaster John’s expertise spans many different genres, from news to music. In his time away from the worlds of politics and business, Lord Taylor is also known as The Soul Baron, hosting a music show for radio. To enquire about Lord Taylor speaking at your event, please access the Taylor Team on the Contact page of his website. Lord Taylor’s intention as an International Speaker is not only to inform, but to inspire. His message is to “strive to be not only the best in the world, but the best for the world”. This Lord and Lady remain philanthropically involved with a number of international organizations which bring positive change to lives. Along with John serving as a Patron to numerous charities, both actively support a multitude of causes. Baron Taylor’s vision for the world is encapsulated in Matthew 5 v 9: “Blessed Are The Peacemakers”. Lord and Lady Taylor continue to expand their interests together. Recently they became involved in the Performing Arts. Laura has coached and trained dancers, who have performed around the world. Last year John became an officer of the Parliamentary Dance Group, which promotes the welfare of dancers, from school children to professionals. Laura’s own expertise includes health and beauty and enjoys consulting as a life coach. She is also an experienced and gifted fashion designer and artist. Indeed, Lady Taylor attended when Baron Taylor was the host of Parliament’s first ever fashion event, part of Government supporting the British Fashion Industry. The couple come from completely opposite backgrounds. John is black Afro-Caribbean, whilst Laura is blonde, Swedish-American. John was raised in inner city Birmingham, known for its car factories and high immigration. Laura’s early life was in rural Texas and Puget Sound beach, Seattle, with Mount Rainier as her childhood backyard. Laura’s ancestors are the famous couple John and Pricilla Alden of the Mayflower, which set sail from Plymouth, England in 1620 to discover America. John’s ancestors date back to slaves on the Taylor Plantation, Jamaica and Dubliners in Ireland. His parents came to England in the 1950s, when John’s father played professional cricket for the Warwickshire County Cricket Club and was a member of the Jamaican national cricket team. The couple describe their work effecting positive and lasting change on a world platform, as a ministry. They feel “called, not driven”. Laura states that “Politics to John and I is about revelation, not just information. Our life stretches far wider than merely concentrating on “politics as usual”. Lord Taylor is a,senior world politician to watch, wait and see. “The best is yet to come!” he says. This unique Lord and Lady couple represents an extraordinary union of America and Britain, in all its glory. Theirs truly epitomizes a special relationship. Editor’s Note: I would like to thank Lord Taylor’s research team and also Lady Laura Taylor for their invaluable work in providing the background for this story. Photo captions: 1) Lord Taylor in the House of Lords. 2) Cover of Lord Taylor’s inspiring book. 3) Lady Taylor at the State Opening of Parliament. 4) Lord and Lady Taylor at the State Opening of Parliament. 5) Their wedding picture. 6) John with Laura in golden dress at a glittering event. 7) Lord Taylor in an Aston Villa FC shirt. 8) Entertainer Pat Boone, with Lord and Lady Taylor at last year’s Media Fellowship Praise Brunch in Beverly Hills, California. 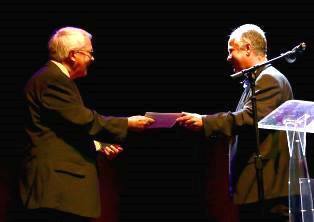 8) Dan Wooding receives the humanitarian award from his son, Peter. 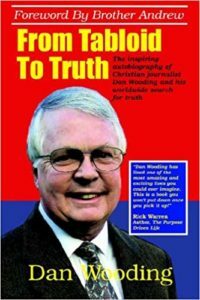 About the writer: Dan Wooding, 76, is an award-winning winning author, broadcaster and journalist who was born in Nigeria of British missionary parents, and is now living in Southern California with his wife Norma, to whom he has been married for more than 54 years. Dan is the founder and international director of ASSIST (Aid to Special Saints in Strategic Times) and the ASSIST News Service (ANS). He is also the author of some 45 books and has two US-based TV programs and also a weekly radio show. Dan’s most recent honor was a top humanitarian award at a film festival in Beverly Hills, California, for his long-standing reporting on persecuted Christians around the world.